It starts off by describing a new street drug, and at first, I thought it was going to be a remake of RoboCop 2. Remember Nuke, the designer drug from that movie? And why do drugs in movies always have such stupid names? Soylent Green. We hear it’s people. So apparently that Lannister queen is flooding the streets of this dystopian city with a drug that makes people feel good. To be fair, if I lived in a post apocalyptic wasteland, I’d want feel-good drugs too. A very large supply of them in fact. You’d think the government would want people on drugs so they didn’t notice the Fallout-style landscape out their windows, but there you have it. And no one can stop the evil Ma-Ma (seriously, that’s Headey’s name in this), other than Judge Dredd and his mutant psychic partner, played by someone who’s entire acting history I’ve completely missed. If she’d look like this in the trailer, I’d be ording my tickets now. Ok, I’m glad it was actually filmed in 3-D. Movies converted to 3-D afterwards usually look bad. However, the “stunning slow motion” part worries me. First, did they name the fictional drug Slo-Mo so they could tie it in to “visually stunning slow motion sequences”? Because that is the lamest pun ever. If you’re putting in plot points just so you can have an excuse to reuse some played out bullet time slow motion effects 3-D might not help as much. The Matrix -1999. Slow motion effects have been played out for over 12 years. Also, and this is minor, the only time Dredd says “I AM THE LAW!” in this trailer, he whispers it instead of shouting it like an O.G. Judge. 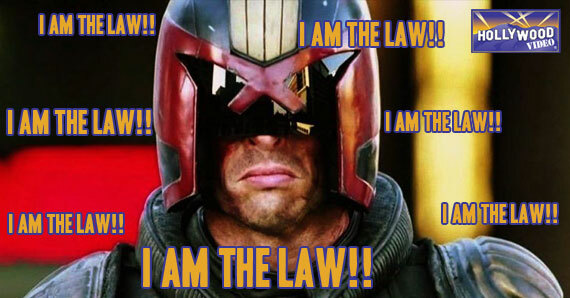 Where’s the vivacity of Stallone’s “I AM THE LAW!!!”?? So will Judge Dredd be as awesome as the studios hope? My prediction is that fans of the movie and of the comic books are all going to watch and then discuss infinitesimal details. I can’t wait until September to find out! This entry was posted in The HV Blog and tagged Entertainment, Film, Judge Dredd, Movies, Preview by rlaitinen. Bookmark the permalink.